There's nothing quite like a warm and comforting stew to come home to after a day of work or play. A hearty stew is especially welcome on a cold winter evening. 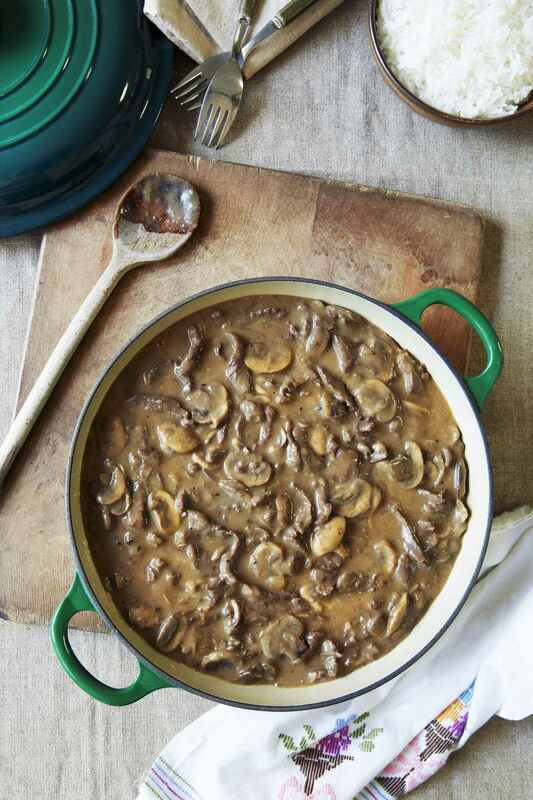 This version is a creamy beef stew from Kim, made with cream of mushroom soup, garlic, and herbs. It's an easy beef stew to prepare and cook in the slow cooker. The condensed soup keeps the stew thick while it adds mushroom flavor and it gives it a creamy texture. The saucy beef makes a fabulous topping for hot cooked egg noodles or rice. Add a salad and some crusty bread, and you'll have a memorable meal your family will ask for again and again. Cut the beef into 1/2-inch to 1-inch cubes. Put the beef cubes in the slow cooker along with the condensed soup, mushrooms, ginger, garlic, oregano, basil, onion powder, water, and black pepper. Cover the pot and cook on low for 7 to 9 hours. Serve the beef and sauce with mashed potatoes, rice, or noodles. To thicken the broth more, whisk two tablespoons of cornstarch or flour with an equal amount of cold water to form a smooth paste. Stir it into the hot stew, a little at a time, until as thick as you like. To enhance the flavor of the stew, sear the beef before you add it to the crockpot. Heat 2 tablespoons of vegetable oil in a skillet over medium-high heat. Toss the beef with a few tablespoons of flour and cook until it is well browned on all sides, stirring and turning frequently. Browning isn't necessary, but it will improve the color, texture, and flavor. For a complete meal stew, add about 1 1/2 pounds of cubed red-skinned or Yukon gold potatoes along with two or three sliced carrots. Add a cup of frozen peas, or a peas and carrots blend about 30 minutes before the stew is ready if you'd like.